Bachelor’s degree/ B.Sc./ Diploma in Engineering, Four-year program in Science, Master’s degree in any branch of Science or equivalent exam, Bachelor’s degree in Architecture or pursuing such programs. Age Criteria: There is no age limit specified in the GATE 2019 eligibility criteria. Candidates in the final year of qualifying degree are also eligible to apply, provided they submit the certificate from the Principal of University or College. Holders of Bachelor’s degree in Engineering/Technology (4 years after 10+2 or 3 years after B.Sc./Diploma in Engineering/ Technology) and candidates who are in the final year of such programs. Candidates with qualifications obtained through examinations conducted by professional societies recognized by UPSC/ AICTE/ MHRD as equivalent to B.E./B.Tech and those who have completed Section A of AMIE. Note: You will have to fulfill all the GATE 2019 eligibility criteria for taking GATE 2019. Otherwise, your GATE 2019 Application will be rejected. Marks sheets: Present a copy of any one of the marks sheets of the final year, or will have to obtain a signature from their Principal/HOD along with the seal on the “Certificate from the Principal” format as given in the notification, that must be printed along with the application document which will be put up after completion of the online application document submission. Bachelor's degree (4 years): The duration of the Bachelor's degree must be at least 4 years. Candidates must have completed or studying in the final year of Bachelor’s degree in Engineering or Technology. Master's degree (2 years): The duration of the Master's degree must be at least 2 years. Candidates must have completed or studying in the final year of Master’s degree in any relevant science subject. Provisional Certificate letter: Candidates have to get this certificate issued by the college / institution authority. This certificate certifeis that the candidate is in the final semester of the study and is having no backlogs at all. The below image is the format of provisional certificate letter which is needed to be filled by the candidate before giving the GATE 2019 exam. 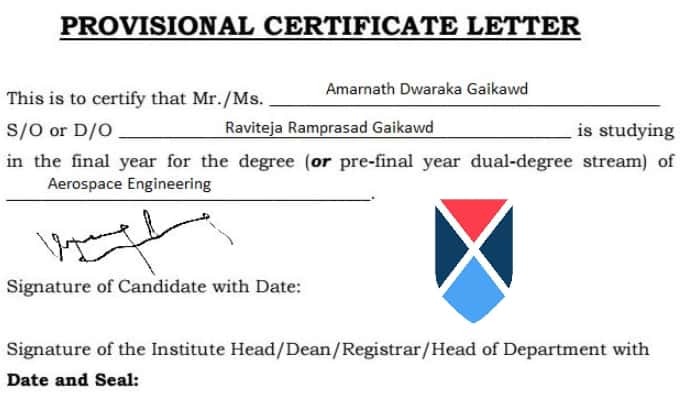 Certificate from the Head of Department/ Institute: In case, the candidate is expected to complete one of the qualifying criteria specified above, he/she has to upload a Certificate from the Head of the Department/Institute or a copy of mark sheet for Section A of AMIE. This certificate must mandatorily have the signature and seal of the Head of Institute/Department with the current date. Note: Eligibility Document, as applicable, has to be uploaded only while filling the online application and NOT to be sent by post. Can I send all eligibility documents and certificate by post? Can I send all eligibility documents and certificate by post? I am not able to upload it online due to some technical error. You need to send all documents online only, in GATE 2019. You cannot send it by post. You can try cyber cafe or any other network area to upload them. I have done integrated M.Sc. Will i be eligible for GATE 2019? I have done integrated M.Sc. Will i be eligible for GATE 2019? It is not technical background. Yes, you are eligible to appear for GATE 2019. For more details, you can check GATE 2019 eligibility criteria. I am M.Sc graduate (chemistry). Can I apply for GATE? You are eligible to apply for the GATE. For more details about GATE eligibility, Click Here. I want to apply for GATE in chemical engineering after completing B.Tech in ECE. I want to apply for GATE in chemical engineering after completing B.Tech in ECE. Can I Do that? 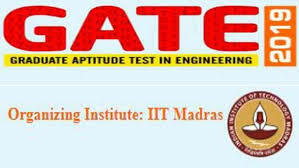 You can Apply for GATE in Chemical engineering after doing B.Tech in ECE. But you have to prepare according to the aerospace engineering syllabus. Click here to know more about GATE eligibility. 2nd year student can apply for the exam ? As per eligibility criteria for GATE exam, you are not eligible for GATE 2018. For more information regarding GATE exam and their criteria click here. Eligibility criteria for GATE 2017. What is the eligibility criteria for the GATE exam 2017? There are many factors which are considered under the eligibility criteria of GATE 2017 exam. Each candidate who wishes to appear in the GATE 2017 exam must fulfil these GATE eligibility conditions otherwise, his/her application for GATE registration will not be accepted. All conditions are clearly mentioned below. There is no upper limit age bar and the candidates are eligible for GATE only after their Bachelor Degree achievement. No age bar is there in GATE Exam 2017. Hence, students with a bachelor's degree are eligible to apply for GATE 2017. The candidate must have a Bachelor Degree i.e. B.Tech/ B.E./B.Pharm/ B.Arch from a recognised University to be eligible for GATE. Either Bachelor Degree in Science / BSc. Research from recognised University is compulsory for the candidate to satisfy the eligibility criteria for GATE. The applicants having Master’s Degree in from any stream Mathematics/ Science/ computer or equivalent or Statistics or Five years B.S. / M.S. Progam or M.Tech or M.E. after BSc are also eligible to apply for GATE 2017. 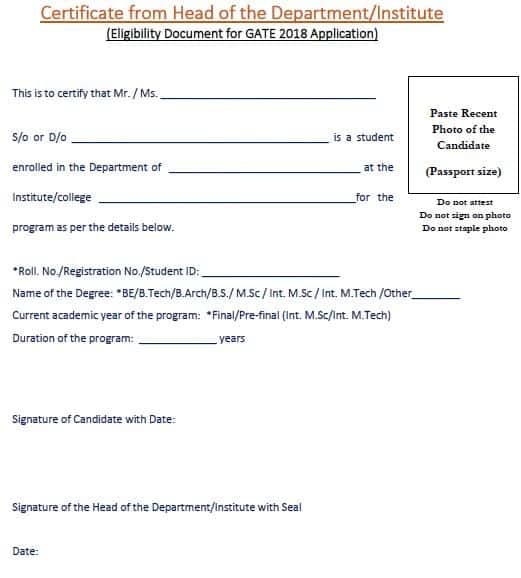 The applicants appearing in the final year of qualifying exam are also eligible to apply for GATE exam provided they have submitted the certificate from the Principal of University or College are also eligible to appear for GATE. The candidates, who have passed the qualifying examination, have to submit their certificate or degree certificate or provisional certificate or they are not eligible. Diploma Holders are not eligible for the GATE examination. I am a Diploma holder from Maharashtra. I had above 70% aggregate in my qualifying exam. Am I eligible for GATE? I'm sorry to inform you this, but diploma holders are not eligible for GATE. The candidate must have a Bachelor Degree i.e. B.Tech/B.E./B.Pharm/B.Arch/Bachelor Degree in Science/BSc. Research from a recognised University to be eligible for GATE. The applicants having Master’s Degree in from any stream Mathematics/Science/Computer or equivalent or Statistics or Five years B.S./M.S. Progam or M.Tech or M.E. after BSc are also eligible to apply for GATE 2017. What about the candidates appearing in their final year of the qualifying exam? Is it a serious issue if the eyesight is slightly outside from specified range for PSUs?Do they directly reject? I advise you to keep in mind the fact that the eligibility criteria and ranges are kept for a reason. I belong to OBC Non-creamy but have state certificate, is it necessary to have central OBC Certificate ?? Yes, it is required to have central OBC certificate. State certificate won't be considered.